Masan Group Office, Singarpore by M Moser Associate Ltd. 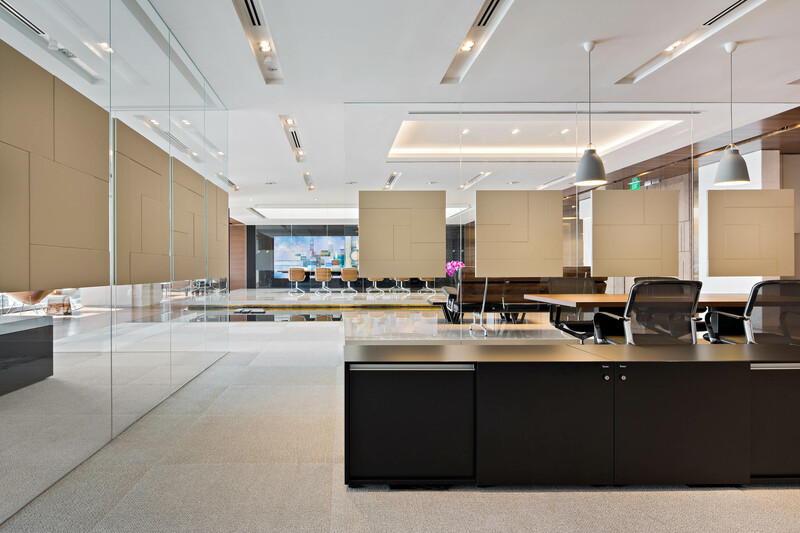 Winner: M Moser Associate Ltd.
Masan Group’s first office outside Vietnam was largely intended as a symbol of the firm’s rise in international prominence, its forward-looking character, and as an acknowledgment of its deep roots in Asian tradition. With only a small work area needed, most of the 464 sq-m space is devoted to client-facing amenities. Upon entering, the visitor’s gaze falls upon a razor-thin film of water covering two-thirds of reception’s floor area. This stunning arrival experience is further enhanced by the placement of a glass-encased conference room atop a wooden raft which ‘floats’ upon the water’s surface. The composition serves as a powerful symbol of Vietnam’s way of life along the Mekong River while connecting the office with its location at Singapore’s Marina Bay. It is also here that the design’s painstaking engineering is at its most impressive: the water feature required exacting considerations of weight-loading on the floor plate, waterproofing, and multiple leak detection systems to execute. As a subtle touch of branding, Masan Group logos break the water’s surface like stepping stones. Capitalising on the outstanding exterior views, transparent glass was used wherever partitioning was necessary within the space. Leather privacy panels – each repeating the geometry of the Masan logo – were applied at approximately eye-level on the partitions, balancing out the transparency with a degree of visual privacy. Furniture for the office was carefully selected to provide a balance of contemporary aesthetics, comfort, and a ‘residential’ or ‘hospitality’ feel that would soften the hard edges of the minimalistic architecture.